What’s so strange about removing a corpse? This is the station I have been worried about. What is there to say about it? Of course Jesus is taken down from the cross, that’s what we would expect, isn’t it? What more is there to say? What message can we take from this station? Well actually there might be more to this than first appears. The Romans used crucifixion, not only as an execution but as a warning to others. The bodies were usually left to hang on the cross, visible to all who travelled into the city. This would terrify anybody who was thinking about opposing the mighty Roman army. Anybody seeing the decaying corpses would think twice and probably keep their thoughts to themselves. After this, Joseph of Arimathaea, who was a disciple of Jesus – though a secret one because he was afraid of the Jews – asked Pilate to let him remove the body of Jesus. Pilate gave permission, so they came and took it away. Nicodemus came as well – the same one who had first come to Jesus at night time. I noticed that only John mentions Nicodemus in his account. The other three evangelists say nothing about him. I’ll come back to that later. 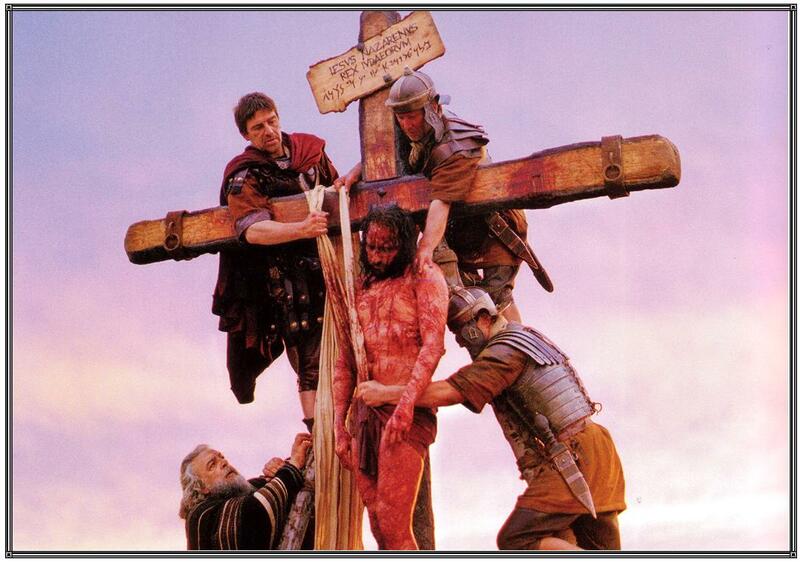 If it was the custom to leave the bodies to rot on the cross why did Pilate readily agree to Joseph’s request? Why did the Jews not object? There’s more to this than meets the eye. What happened at the death of Jesus that seems to have caused this change of heart? Looking back we see that when Jesus died on the cross there were great signs. Matthew recounts them. At that, the veil of the Temple was torn in two from top to bottom; the earth quaked; the rocks were split; the tombs opened and the bodies of many holy men rose from the dead. I think it is fair to say that people knew that something terrible had happened. The centurion is quoted as saying “In truth this was a son of God.” Even the heathens knew that this was no normal execution. I wonder how those responsible felt about their part in this when they saw those signs? Pilate of course had been warned by his wife and was reluctant to become involved. His hand washing at the pavement was his attempt to avoid any blame. Have you ever had an instance of a child breaking an ornament and then hiding it under the sofa, pretending it had never happened? I think the authorities were behaving like that. The removal of the body, hiding it in the tomb was their denial. They were anxious to have the whole business forgotten, swept under the carpet. Of course we know now that that is not what happened. Things took an entirely different course altogether. The apostles seem to have been in shock. This was not what they had expected. The triumphal entry into Jerusalem a few days before seemed to promise a great future for Jesus and for them. Now they were in hiding and everything seemed to have come to nothing. Peter, who had been made the head of the Church by Jesus had denied his master and was riven with guilt. The ‘Church’ was in disarray. This is where Joseph of Arimathaea and Nicodemus come in. We met Nicodemus earlier in the gospel story. He had come to Jesus in the night. He was a prominent Jew who came to believe in Jesus. He came out of darkness into light. Joseph of Arimathaea is said to be a secret believer. He was afraid to show his belief for fear of what the Jews might do to him. In the story so far they are nobodies. They have no prominence. Now, when it all seems to be falling apart, it is these men who step forward and take charge of the body of Jesus. It is they who place Jesus in the tomb. This would normally be something a family would see to. In a sense we are seeing a new definition of family. Joseph and Nicodemus step up and ensure that God’s plan will proceed. The authorities would have expected the execution of Jesus to scare off any followers of Jesus and, as we see in the case of the apostles, it worked. Strangely enough it was the people who had been afraid before who now acted. We see a transformation in those who, like Joseph and Nicodemus, had been afraid but now put their fear behind them. The crucifixion had strengthened their faith rather than destroy it. This is something I had not realised before. When the Church was in its first crisis it was not the apostles who pulled it together but just ordinary followers. That rang a bell with me. The Church in Scotland found itself in a crisis again recently when the Cardinal admitted some wrongdoing. The media appeared outside the cathedral in Edinburgh to ask the Catholics coming out of mass how their faith had been affected by the revelations. I remember two Edinburgh ladies explaining that their faith had not been shaken at all. Their faith was in God, not in any of the priests, bishops or cardinals of the Church. In the days that followed ordinary Catholics rallied and showed that the Church is still the Church started by Jesus no matter what foolishness we humans bring to it. So the message for me in this station is in the nature of a question. What kind of follower am I? When things get difficult and the Church is held up to ridicule what is my reaction? Am I tempted to shut myself away from it all? Perhaps I’m the kind of Catholic who might like to distance myself from it all. Perhaps I’ll find myself saying that I’ve always had my doubts and now I can see how wrong we were. On the other hand I might be the kind of Catholic who sees the Church as my home. Am I the sort of Catholic who sees the Church as something made up of people rather than an organisation that I can join while it suits me? I hope I see myself as part of the family that is the Church. I hope I’m the sort of Catholic who smiles when he listens to people who say the Church should share out all its wealth with the poor; a smile because the wealth of the Church is the faith of its people. I’ve been lucky enough to witness that treasure being shared out to the poorest people in the world by priests, nuns and many lay people. It is those who give of themselves, not those who only give some money who are sharing out the treasure of the Church. The message in this station is easy to ignore. We can just Look up at the image of Mary holding the lifeless body of her son, recite “I love you Jesus, my love above all things.” and then move on to the next station. Perhaps, though, we might pause and ask ourselves whether we would join with Nicodemus and Joseph of Arimathaea and keep God’s plan on track. They found themselves in the most difficult of times and found their faith strengthened. Perhaps these difficult times will strengthen our faith. Jesus is Taken Down From the Cross – Nothing Strange There? I was worried that there was nothing much to say about a body being removed from the cross. How wrong I was. Extraordinary when you think about it. 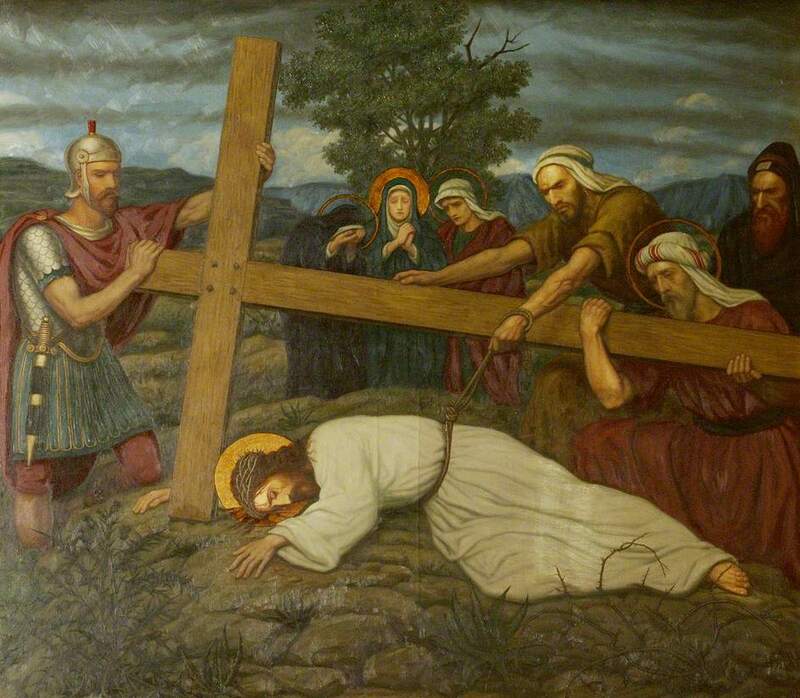 Read my musings on the thirteenth station on the Way of the Cross in this week’s Scottish Catholic Observer. It’s out today and you can pick it up at your local parish. The full text will be available here next week, but the paper has so much more. The Way of the Cross 12 Jesus Dies on the Cross. On the way of the cross we have been following the progress and suffering of Jesus as he made his way through Jerusalem to Calvary. We have been looking at each situation to discover what messages are contained there for us. In this station we come to the death of Jesus. It is a scene of loss and sadness. It is also one of relief that his suffering has come to an end. His suffering has put our own pain into perspective. Is that what this station is about, relief that it is all over? After all his suffering it comes as no surprise to us that Jesus dies. It did come as a surprise to Pontius Pilate. As we will see later, he thought the death would have come much later. It is worth looking at how the cross kills. Death on the cross was a slow process. The victim is suspended by his arms with his legs helping to support his weight. The effect of this was to restrict his breathing and as he tired more pressure on his breathing would eventually kill him. This was a slow tortuous process intended to inflict a great deal of suffering. The crowd has gathered to watch the spectacle. Many laugh and jeer. We might find this hard to understand but it is worth remembering that public executions in this country only ended in the UK with the execution of Michael Barrett on the 26th of May 1868 outside Newgate prison. In the case of Jesus the crowd did not understand who he really was. When he cried out he was offered vinegar to drink, probably vinegar and water as a way of hydrating him and keeping him alive to extend the suffering. How did Jesus behave in his suffering? He continued to teach us how to live. There were two thieves crucified beside him. To the thief who confessed his guilt and asked to be remembered he promised paradise. Before giving up his spirit he asked the Father to forgive his tormentors. There is a powerful message for us there. How easy is it to forgive those who we think have slighted us or hurt us? Yet here is Jesus forgiving not only criminals but the very people who have tortured and put him to death. Pilate orders the victims’ legs to be broken to hasten their death as it was almost Passover. Breaking the legs of the victims meant they could not support their weight and the whole weight would act to restrict their breathing. 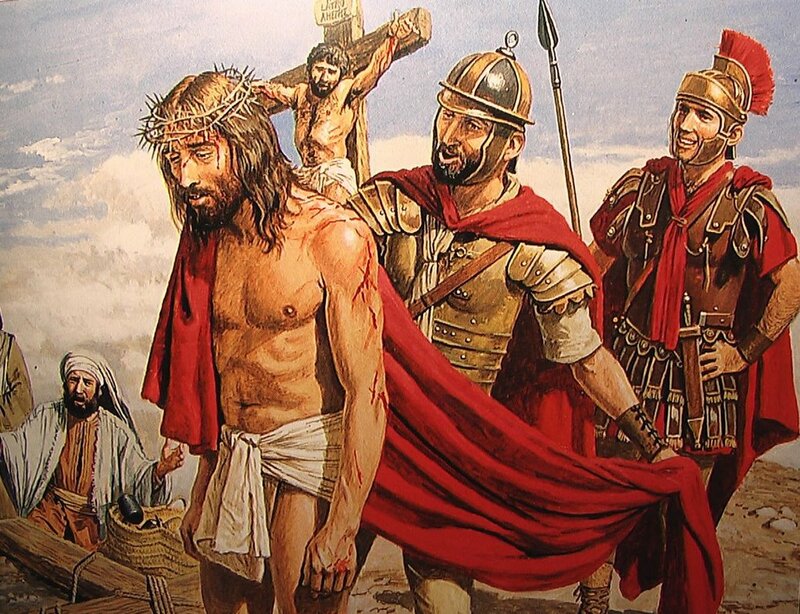 The soldiers reported that Jesus had already died, much to the surprise of Pilate. Jesus was not to be ruled by death he was about to conquer death. At his death Jesus has now left his human condition, his work done. What was his final message to us? Jesus had already taught his followers that the commandments could be summarised in two simple commandments. Now in his crucifixion Jesus is revising that teaching. He goes much further. Jesus dies on the cross to save each of us. In doing so he demonstrates a love for us which is greater than love for himself. I think this is the most significant message Jesus gives us in his last act. The message is clear; Jesus’ sacrifice was to complete the Father’s plan for us. He demonstrated his love for the Father and his love for us. If we are to take up our cross as Jesus instructs us then we must love God and love our neighbour more than we love ourselves. Does this mean we must all be martyrs if we are to be true Christians? That is too simplistic. It really means that our neighbour’s needs are not to be put aside until we have completely satisfied all our own needs. We can’t put off helping the hungry until we have had our lavish Christmas dinner. We might have to put off buying those nice shoes we saw in the shop window and spend the money on helping the victims of Ebola virus. We can find lots of examples of people who put the needs of others before themselves. The medical staff who travelled to West Africa to treat Ebola victims, risking their own lives, come to mind immediately. Think of others whose lives are put at risk for the wellbeing of others. I recall watching a fire engine racing towards a block of flats and thinking, what kind of person will run into a burning building when everyone is running out? These are special people indeed. We have example of priests and religious who give up a normal family life in the service of the rest of us. What does that mean for us? In marriage we must live not only with each other but for each other. Our lives are put at the service of our spouse and our children. Jesus dies on the cross. Our cross is to live for others, not too much to ask in comparison. Now you might be thinking that this article is a bit serious for a Christmas edition of the paper. Surely we should be thinking of happier things at Christmas? Well, I think it is a fitting topic and I’ll tell you why. At Christmas we are celebrating the birth of Jesus. A child’s birth is always a cause for great celebration. But, this birth is different. Jesus brings joy, not only to the family and those around but he brings joy for all mankind. This birth is more important than any other because it is the beginning of the process of our redemption. Jesus has come, not only to let mankind experience the presence of God among us but to teach us how to live with each other and to open Heaven for us. The Nativity and the crucifixion are the beginning and end of Jesus’ time on earth. Without the Nativity there could be no salvation and without Calvary the Nativity would be insignificant. While we are enjoying our Christmas celebrations and visiting the child in the manger let us remember that this child came to change the world. His coming is a threat to many and a promise of salvation for all. He presents us with a choice; indulge yourself in the pleasures of this world or join with me in changing the world for ever. It is tempting to just sing the carols, send the cards and wish each other ‘Happy Christmas’. It is surely a time for great joy and celebration. We will all be giving and receiving gifts but are we prepared to go further and take up Christ’s challenge and give up our lives? Is This Suitable for Christmas? My December column is published today in the bumper Christmas and New Year edition of the Scottish Catholic Observer. 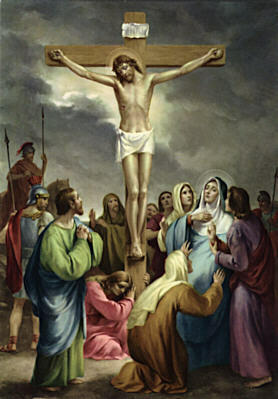 It deals with the 12th station on the Way of the Cross, Jesus dies on the cross. Is this relevant to Christmas, a time of joy and celebration? Get your copy today and see what you think. In this series of articles I’m taking the Way of the Cross and pondering on what each station is saying to us. I must stress that these are personal thoughts and if they seem a bit strange then that’s about me rather than the Church. The eleventh station recalls that Jesus was nailed to the cross. We are all familiar with this. I grew up in a house with a crucifix on the wall. My rosaries have a small crucifix on the end. Jesus nailed to a cross has been the wallpaper of my life. Every church I visit has at least one crucifix. Some are small and some are large they are all works of art. I expect to see a crucifix on a church, a classroom wall, in a home. It is just a familiar item. A few years ago I read an article by a woman who had gone into a church and was shocked by the sight of a man nailed to a cross – a crucifix. What sort of people are these who have horrible things like that in their churches? I was shocked at her reaction. Had she never seen a crucifix? Where was she coming from? Now I’m sure you learned the same thing as I did at school; Jesus died on the cross for my sins. That is disturbing but this giant crucifix brought home to me the enormity of what happened. No other crucifix I have seen has had this effect on me. How do I deal with this? As usual I’ve pushed it to the back of my mind to pretend it is not there; but it is there and will not go away. Peter Howson is an artist I have admired for some time. He paints picture that do not flatter but point the finger. He completed his “Saint John Ogilvie” for the refurbished cathedral on Clyde street and there was an exhibition of some of his preparatory sketches and paintings in the adjacent offices. I went along, eager to see how he had come to his final work. The whole exhibition was very moving. One sketch in particular caught me. It was the face of Christ, crowned with thorns and terrified! This was not the quiet suffering face of Christ I had seen in many works of art. This was the face of a man about to go through an extremely brutal experience. He was about to be nailed to the cross. This image made me stop in my tracks. It was the first picture I have seen that conveyed the true horror of what Jesus underwent; and he did it for me. Suffering is not something we are unaware of. If you are clumsy like me then you you suffer lots of minor accidents. Have you ever hit your finger with a hammer? I’m not trying to promote this as a hobby. It is very painful and produces all sorts of words your children should never hear. I have done this many times; take it from me, it is not to be recommended. It is even worse to puncture yourself. Getting a cut in the kitchen or even pricking yourself with a needle cause pain but it passes and soon heals. Have you ever stapled your finger? That’s altogether different. It hurts on the way in and it is really painful on the way out. That’s because, unlike the needle or the kitchen knife, the edge of the staple is ragged. When they nailed Jesus to the cross they didn’t have the smooth, regular, machine made nails we are familiar with. In those days nails were made by hand by a blacksmith wielding a hammer. The nails were bashed out of bars of iron. There was nothing delicate about these rough-hewn pegs. 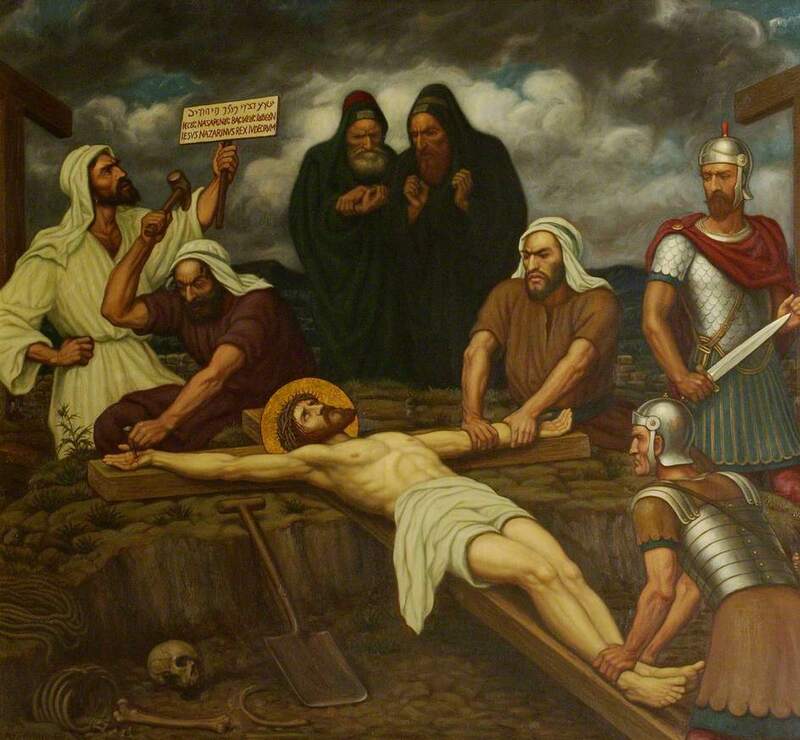 Jesus was held down and the nails were bashed through him into the wood. Most of the old paintings show the nails piercing his hands but more recent commentators have decided that it is more likely that the nails pierced his wrists. I don’t know if it makes a difference which one it was. In both cases the nails must have shattered bone and muscle. It is really too horrible to contemplate. A few years ago, in 2004 to be exact, Mel Gibson directed a film called ‘The Passion of the Christ’. It re-enacted the last twelve hours of Jesus’ life. The Passion of the Christ is the highest grossing R-rated film in United States history, and the highest grossing non-English-language film of all time. It caused outrage. Some critics called it obscene. It was shown on television a few years ago and I decided to watch. I gave up watching at the scourging at the pillar. It was obscenr because it was depicting that was too horrible to watch. Some complained that it was blaming the Jews for killing Jesus. Some complained that the extreme violence obscured the message. I don’t agree with either complaint. The film made me feel that I have caused this horror because Jesus died for my sins. The violence is part of the message. We find it difficult to deal with the violence because it reflects on us. This year and especially during the month of November we have been looking back to the First World War. Our televisions have shown us the slaughter that both sides inflicted on each other. We have paid tribute to those who died for their country. We have solemn parades and use the poppy as a symbol of the blood let on Flanders fields. Yet we fail to look at the real horror. This was a war where new weapons were devised to kill more man more quickly. Soldiers were killed by poison gas; flamethrowers were introduced to exterminate whole trenches of men. Machine guns provided mechanised killing. Aircraft were used to bomb civilians for the first time and battleships shelled towns on the east coast. Things only got worse from then on. Today we have weapons that can exterminate continents. We use advances in technology to bring the horrors of war to any place on the world, to any people and we can do it without leaving the office. What is the significance of Jesus being nailed to the cross? Is Jesus showing us how we use cruelty and violence to get our own way? It was a warning to us. He showed us that it is in our human nature to be cruel. Despite the gifts of intelligence and science we have been given we can usually find a way to misuse them. 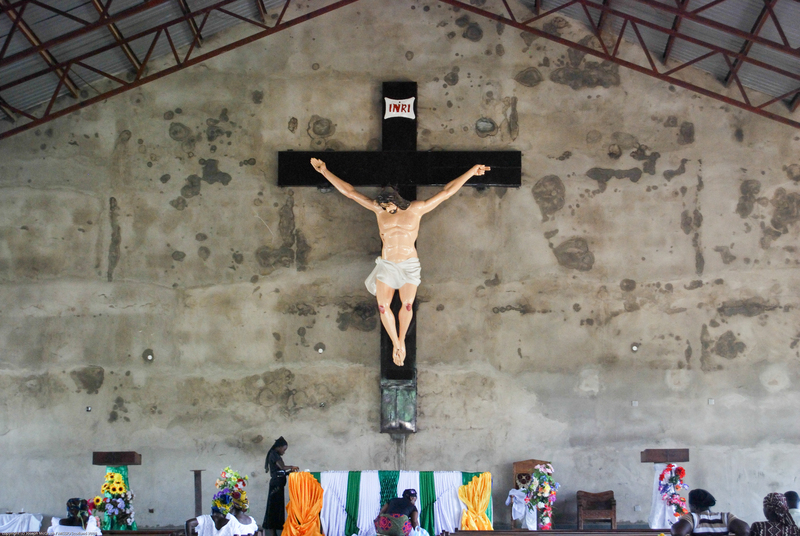 Why do I prefer the small crucifix on my rosaries to the large on that church wall in Nigeria? Well I suppose I find it hard to face up to the fact that it was my fault. The eleventh station on the Way of the Cross is the subject of my November column in the Scottish Catholic Observer. It’s out today. Hurry down to your local parish for your copy this weekend. If you are too late don’t worry because the full text will appear here next week. It’s much better to get the paper, though, because there are other writers of interest there. 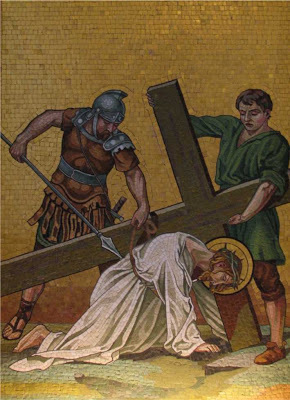 The tenth station on the Way of the Cross concerns Jesus being stripped of his garments before he is crucified. Considering the treatment Jesus experiences on this journey, this might seem to be almost trivial in comparison. In our society people go off to Spanish beaches and strip at will. What is the significance of this station? Obviously Jewish society in Jesus’ time would not have shared our permissive attitudes. To strip someone in public would be to shame them, to remove their dignity. I suspect most of us would feel the same despite the permissive society we live in. Clothes are very important to people. Your clothes don’t just guard your modesty; they make a statement about you. Your clothes can say something about your status in society. Their messages can be confusing at times. We had a conversation about a dress code for Eucharistic ministers at a recent Parish Committee meeting. Is it permissible to wear jeans on the altar? I noted that my ‘respectable’ trousers from the outlet shop cost much less than the expensive jeans worn by many young (and not so young) people. Who is being more respectful? Keeping up with fashion can be tricky and I suppose I’ve just given up on that one. Clothing can also tell about what we do. Uniforms identify nurses, firemen, the police and other groups who command our respect. We can choose our clothes to put on appearances, to create the right impression and, perhaps, disguise who we really are. Clothes don’t just fool other people about who we are. If we choose the right clothes we can feel better about ourselves. We like to pretend we are somebody special. When the soldiers stripped Jesus they thought they were stripping him of his dignity. They took his clothes and even drew lots to see who would get his seamless garment. They thought they could win this ‘treasure’. In fact their attention was on a piece of cloth while the real treasure was being nailed to the cross. How easily our attention can be taken by the clothes and we miss the real person inside them. In the Nazi concentration camps of the second world war the victims were stripped of their clothes and their dignity before they were gassed. The guards collected their clothes and meagre belongings as a fundraising exercise. They valued the belongings but not the human beings. My clothes can hide the real me. Perhaps they hide the real me from me as well as everyone else. Perhaps I’m not too keen on looking at the real me. What am I trying to hide? I suppose I’m not terribly impressed by the real me. Without my clothes to create a good impression I’m just an ordinary human being with no status and no special properties. Worse than that; I’m an imperfect human being. When Adam and Eve lunched on the forbidden fruit they discovered their nakedness and were ashamed. They donned some makeshift clothes to hide themselves and hide their sinfulness. We have been doing the same ever since. We don’t want to admit that we are only sinners. We are ashamed of that. When Jesus was stripped of his garments he showed us his humanness. He was a human being with a body just like ours and he was God. By adopting our humanity he showed us that our dignity does not come from our clothes or the worldly status the clothes proclaim. Our dignity comes from being human; from being created by God. Not only are we created by God but God sent his Son to be sacrificed for us. We are created in God’s image. What greater dignity could we hope to have? One of the most important things I learned in my teacher training course was that we can not learn anything unless we realise that we don’t know. It’s only when we realise that we don’t know something that we can set about finding out. Similarly, it is only when we realise that we are imperfect that we can go about improving ourselves. We tend to think of ourselves as being nice people. I had a woman at the door a year or so back with a bible tract that declared that Jesus would return to deal with the wicked people. She asked me when this would happen. She was a bit disturbed when I said that I hoped it would not be for quite a while. “Why don’t you want Jesus to come and deal with the wicked?” she asked me. I told her I needed some time to sort myself out or he would be dealing with me. She insisted that I was wrong. Jesus was coming to deal with the wicked, not people like us. She wasn’t too pleased when I hinted that we might think we are ok but others might have another opinion and I would need some time to improve. She went away but I don’t think she understood my point. There are none of us so good that we can presume that Jesus won’t be coming to deal with us. When we can admit to ourselves that we are sinners we can start to get things into perspective. Try as we might we do not have the power to make ourselves perfect. Only God has that power and I for one am relying on his infinite mercy for my salvation. The whole point of the crucifixion and Jesus’ suffering on the Way of the Cross was to save us; all of us. He did not come to condemn anyone. Jesus is ready to forgive our sins. He is ready to forgive all our sins, no matter how terrible we might think they are. He will forgive the greatest sinners. Who is the worst person who has ever lived? Is it Hitler? Is it Stalin? Try to imagine the greatest sinner and now try to imagine how anyone could be so forgiving as to forgive that terrible person. Well Jesus can do that. I’m trying to imagine what it would be like to die and go to Heaven. Who would you meet there? I would imagine meeting the great saints and the martyrs. Perhaps I would come face to face with Adolph Hitler. How could that be? If the greatest of sinners looks at themself and admits what they have done and asks for forgiveness with true contrition then Jesus will forgive them. That’s the message in Jesus being stripped of his garments. We must strip away all the trappings of status and grandeur we like to clothe ourselves in and face the real person we are. I need to acknowledge my sinful nature and admit that’s who I really am. Then I can ask God for forgiveness and by his mercy be forgiven. I don’t really need fancy clothes to impress people. If other people can’t see beyond the cloth and recognise me as a person, then that’s their problem. After all, the God who created the universe can see who I am despite my numerous failings he sent his only son to save me. If you ever have one of those days when you feel worthless, then just remember God sees you differently. My series of articles on the Way of the Cross continues this month with thoughts on the tenth station, Jesus is stripped of his garments. How significant is this event in the light of the horrors of crucifixion? Why is this included in the way of the cross? In an age when people regularly fly off to sunny shores to strip themselves of their garments it might seem to be a strange thing to pray about. Perhaps it goes deeper than that. My column is published in this weeks Scottish Catholic Observer. Why not get down to your local parish and get a copy? You may find it interesting. If you are too slow and the papers are all gone when you get there, don’t worry. The full text will appear here next week. This month I’m looking into the seventh station on the Way of the Cross. Jesus falls for the second time. The second fall should not be unexpected. Jesus was getting weaker with loss of blood. Yet a second fall brings with it the warning that this will continue. I wrote earlier about tripping on a kerbstone in Paris and the shock of the fall. The problem is when tripping becomes normal. Last year I found myself suffering with sciatica. I thought it would go away by itself but it got worse. What can you do? I went to the doctor and he sent me for physiotherapy. I thought that was helping but found I was stumbling when I walk. It now appears I have a worn hip so I just keep taking the tablets. When I walk I sometimes find my foot doesn’t go where I meant it to go. Tripping and the consequent fall has become a feature of life now. Jesus’ second fall is a metaphor for sin. Just like my occasional fall, falling into sin becomes a feature of life. We can think of a fall from grace or a fall into sin. Falling into sin makes sin sound like a trap and so it is. I don’t know about you but I can excuse myself by thinking that a sin is not serious or is not harming anyone. That’s the trap. Just like my problem with tripping falling into sin is a normal part of life. We need to be aware and ready for the unexpected. Now, in sin, I’ve changed my perspective. I’m seeing things slightly differently. When my perspective is distorted my decisions get distorted too. I’ll give you an example. I’m six foot two and I can reach for things on high shelves but often get into bother because if you measure me I’m only five foot eight. I have a similar problem with cameras that don’t capture my full head of hair. I think you get the picture. If my view of reality is distorted then my relationship with others will be too. My sin distorts my view of the world unless I realise that I am wrong and do something about it. To return to the analogy of the fall, you can’t get up unless you know you are down. This was brought home to me recently when I read on Twitter about a woman in America who threw her children out of the window. That was disturbing, shocking. What was more disturbing were the comments added by other readers. They posted all sorts of suggestions about the sorts of torture that the woman should suffer. The comments were based on the view that this woman is evil. Nobody suggested that she might be suffering from some psychological disorder and be in urgent need of help. Was this based upon the perception that we are good and guiltless and the woman must be evil? If so then we are in the trap of sin. None of us are without sin. Once we realise that we can look with compassion on others. Another example I found in the news was the funeral of Fr. Kenneth Walker who was murdered trying to defend his fellow priest in Phoenix, Arizona. A group of protesters from Westboro Baptist church demonstrated with placards at the church. They are an unaffiliated church and have been demonstrating at the funerals of service personnel who died in Afghanistan. They claim that these things are God’s punishment. I suppose that’s an old idea of God. It’s a picture of a vengeful God who is watching out for us to fall into sin and take revenge on us. Nothing could be further from the truth. Jesus came to save us, not condemn us. The sufferings and falls we contemplate in the Way of The Cross are how Jesus took the punishment for our sins. God is always ready to forgive. We just need to turn back to Him. How often have you heard people talk about Catholic guilt? The story goes that we are brought up in an atmosphere of sin and guilt. This causes all sorts of psychological problems that are only solved when you give up religion. Of course it’s all nonsense. Being aware of sin and the effects of sin on our lives gives us the opportunity to change and improve life. As Catholics we have the sacraments to help us be reconciled with Jesus and rid ourselves of any burden we feel. If we are forgiven, free of sin, then we are in a position to treat others in the same way. We should be able to “forgive those who trespass against us”. How much evil in the world is committed because of perceived wrongs others have done to us? There are wars in Africa and the Middle East caused by real and imagined wrongs. How much better the world could be if we were more ready to forgive. We can look to South Africa for a great example of this. The black people in that country had faced oppression under the Apartheid regime for decades. Families had suffered great injustice and brutality. When the regime fell there could have been terrible bloodletting as people took revenge. Instead there was a system of Truth and Reconciliation. People could own up to what they had done and were forgiven. The bloodbath was avoided. So how do we get out of the trap? It’s not easy. You know the story about the man who took a shortcut on his way home from the pub. He cut through the cemetery and fell into a grave dug for a funeral next morning. Try as he might he could not get out so he sat down to wait for morning. Soon another reveller fell into the same grave and tried to climb out. The first man tapped him on the shoulder and said “You’ll never get out.”. But he did with one jump. Who can give us the tap on the shoulder? Who can help us out of the trap? Obviously Jesus is the one to turn to. In Jesus we can find the compassion we need to help us. We can find him in the sacrament of reconciliation. Some of us find that very difficult. We can’t shrug off the feeling of guilt and can’t bring ourselves to take that step into the confessional. In this second fall we see Jesus, in his agony, get up and take an even more difficult step. He encourages us to do the same. I had a friend who had been away from the Church for years. After attending the funerals of two lifelong friends in succession he decided it was time to set things to rights. He told me he went to confession, ready for a hard time from the priest. He was surprised to find that rather than a hard time he was welcomed back and his sins forgiven. There was a visible change in him. He was a happier man in his dealings with everyone. When we see Jesus get up from his second fall in the seventh station we should be reminded that no fall is too great for his compassion. No matter how far we fall or think we have fallen Jesus is there to help us up again. So let’s forget about guilt and concentrate on forgiveness. Jesus is ready to forgive us and we must be ready to forgive one another.